The Harder Hotel was constructed in 1901. It is significant for its association with the commercial development of the town and as a very early manifestation of the building boom of second generation hotels that was occurring statewide during the first quarter of the twentieth century. The hotels built during this period, as exemplified by the Harder, were multi-floor, brick buildings that offered the most "modern" conveniences and catered especially to the businessmen that traveled via railroad. 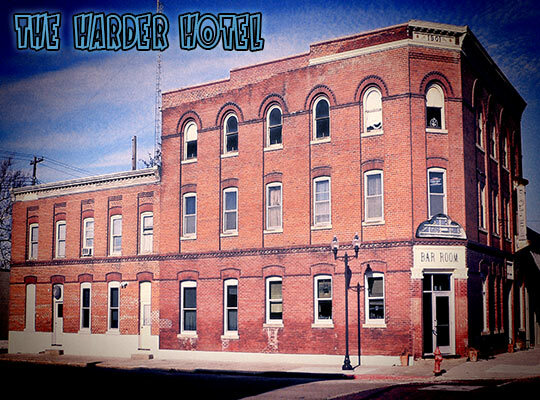 The Harder Hotel is especially interesting because it was built right at the turn of the century and contrasted sharply with what appears to be the only other hotel in the town; a first generation hotel of wood frame construction with limited facilities. The hotel was added to the National Register of Historic Places in 1989. The second and third floor rooms in the building are now permanently vacant and the Old Hotel in Scribner, presently operates only as a restaurant and bar, and is known as the Old Hotel Cafe & Saloon. On several occassions, a piano playing has been heard by a few of the older ladies that come in to the hotel's dining room to drink coffee during the day, and late at night, the sound of young children playing, can sometimes be heard coming from just outside the hotel. Alleged deaths that reportedly occurred in the hotel include a man found dead in one of the rooms on the second floor, and a woman found dead in one of the closets located in one of the hotel rooms. There is also a story of a man who supposedly flung himself from the top floor of the hotel. PRISM founder and lead investigator, David Pierce Rodriguez and PRISM investigator Dan Christianson, conducted a preliminary investigation of the Old Hotel. A tour of the hotel was given by Brandi Weatherly, the hotel owner's daughter who currently works at the hotel as a bartender and waitress. Many photographs were taken and approximately 30 minutes of audio was recorded in one of the hotel's second floor rooms. Baseline EMF readings were taken. There were a couple of areas on the second floor where anomalous EMF spikes occurred at a range of 2 to 3 mG over the EMF floor. The PRISM investigation team consisted of David Pierce Rodriguez, Dan Christianson, Trevor Redmond, Carl Norgard, Dottie Norgard, Amber J., Karen Copeland, Ralph DeStefano, and PRISM Norfolk's Anney Horn. Hundreds of photographs were taken and almost 30 hours of video was shot. Several hours of audio was recorded as well on 5 different DARs (digital audio recorders). The full body apparition of a man with a hat was seen walking into one of the abandoned rooms on the 3rd floor. Several investigators went into the room and felt as if they were being touched on the head by something in the adjoining bathrooms. One investigator was even pushed with such a force that he fell over. Unfortunately the video was running at 15 FPS and the image was unable to be seen clearly on the DVR. The investigation team consisted of PRISM founder David Rodriguez, PRISM investigator Josie R., and guest investigators Todd Lee, Sara Lee, Nick Wigton, Hali Smith, and Amy Wood. Throughout the night, several of the investigators felt as if they had been touched. This all occurred during the two to three hour period while it was raining outside.